Lillian Yim, a junior at Farmington High School, has been studying cello with Katie Kennedy for seven years. 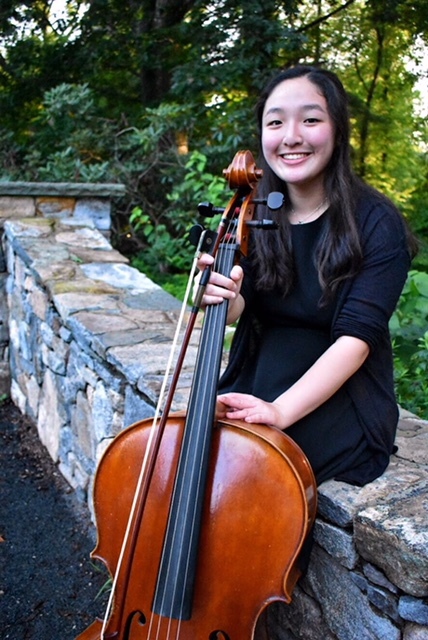 Lillian has served as principal cellist of the Connecticut Youth Symphony (CYS) and the Tanglewood Young Artists Orchestra. She has received top scores at CMEA Northern Regional Orchestra Festival and CT All-State and was chosen for the All-National Symphony Orchestra. In 2018, in addition to winning the Hartford Music Teachers Alliance concerto competition, Lillian placed second at the Musical Club of Hartford Solo Competition and the CT-ASTA Solo Competition. An avid chamber musician, Lillian has been a part of the Hartt Community Division program and received several Honors Scholarships. This past summer, Lillian attended the Indiana University Summer String Academy where she studied with Csaba Onczay of the Liszt Academy in Hungary. She was selected to play in masterclasses, recitals, and studio classes. In 2017, Lillian attended the Boston University Tanglewood Institute Young Artists Orchestra program, where her piano trio was picked to play for Tanglewood on Parade. In previous summers, Lillian has attended Credo Prelude Boston and Kinhaven Music School, for which she received the Stephen Kates scholarship to attend. Masterclass clinicians include Jonathan Dormand, Amir Eldan, Norman Fischer, Lynn Harrell, Rick Mooney, Jonathan Spitz, members of the Heath, Juilliard, and the Verona String Quartet, along with the Lions Gate Trio. First Performance: Helsinki, Finland, July 2nd, 1900, Helsinki Philharmonic Society under conductor Robert Kajanus. From 1809 to 1917, Finland was a semi-autonomous province under the jurisdiction of the Russian Empire. With much of its economy and cultural controlled by Russian bureaucracy and censors, the Finnish people longed for independence. Russian censors worked tirelessly to suppress Finnish culture and forbid the performance of national folk songs or hymns. Finlandia was Sibelius’s patriotic solution to bring Finnish culture to the concert stage and evoke a feeling of national pride with his Finlandia Hymn which concludes the work after a tumultuous struggle of musical forces. First Performance: Queen’s Hall, London, England, October 27th, 1919, London Symphony Orchestra under the direction of the composer, Felix Salmond, soloist. Once again, a much beloved piece by audiences and orchestras today premiered under strained circumstances. The LSO’s opening concert of the 1919-1920 came upon the heels of World War I. Desperate to present a polish performance, LSO conductor Albert Coates cut into Elgar’s time rehearsing with the orchestra on the concerto. In a program which consisted of Borodin’s Heroic Symphony, Wagner’s Forest Murmurs, and a work by Scriabin, the concerto was left to fend for itself. Such was Elgar’s contempt for Coates, he considered pulling the premiere from the program but recognized Salmond’s dedication to preparing the work. Despite his instincts, Elgar conducted the gravely under-rehearsed LSO in what was an abysmal performance of the concerto. Critics were unforgiving at the time and the piece received only one other performance that year. Despite this, Elgar went on to record the concerto (in the era of acoustic records) which helped to repair its shadowed reputation. First Performance: Karlsruhe, Germany, November 4th, 1876, Museum Orchestra, under the direction of Felix Otto Dessoff. With sketches begun in 1854, Brahms had inherited Beethoven’s symphonic crown. Dubbed “Beethoven’s 10th Symphony” by some, the 21 year endeavour to complete the C minor symphony demonstrates the musical and emotional struggles Brahms faced. Destroying early copies and rewriting whole portions, Brahms felt the burden of the musical intelligencia to produce a work worthy of Beethoven and at the same time push the genre into a new era. What emerged was a symphony that now defines who audiences and players know to be a style that is truly Brahms, not Beethoven.